Total Workshop search results: 22. 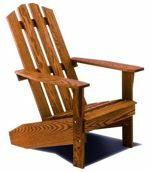 Displaying Page 1 of your woodworking search phrase LAWN CHAIR PLANS. The plan says: Once you have tried this settee you will probably agree they are tops in lawn furniture. The secret is in the curved seat and curved back. Build one set and you'll probably be asked to build a dozen more. No special tools or skill is required. This is a vintage woodworking plan. Visit our FAQ page for a full definition. View the Larger Image Slideshow to see the actual item you are buying. Ever since the first tables were built, social groups have gathered around them. This pattern shows this low informal one, perfect for patio or lawn. The hexagonal top is more interesting than a square one and is easier to build than a round top. It is 37-5/8 inches across and supported by a sturdy, bolted 6 leg frame. 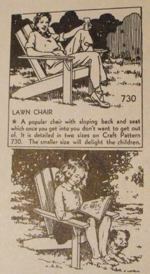 The comfortable arm chair on the right is craft pattern 1748. 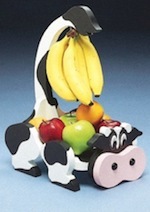 It is designed to fit your body, and the arms are placed at a comfortable height. The chair on the left is craft pattern 749 along with a lawn bench. All of this furniture is easy to make, and the slat construction is preferable to wide boards since the slats will not warp the way wide boards do, and they afford quick drainage after a shower. 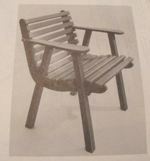 Also matched with craft pattern 793, Lawn Platform Rocker. This is a vintage woodworking plan. Visit our FAQ page for a full definition. View the Larger Image Slideshow to see the actual item you are buying. Build this sturdy bench of whatever length you want, provided the variation makes no waste in cutting. The bench illustrated is 6 feet long. The legs are assembled as integral units so, after making the number needed, adjust the spacing to accommodate the length of seat and back needed. You will like the twenty inch chairs (pictured in the slideshow). Trace the full-size patterns in this craft pattern upon the leg material, saw out the pieces and nail together. Then it is a simple job to nail seat and back slats to the legs. This plan is for making your own PVC lawn furniture. Included are how to make the chair, chaise and ottoman or side table. 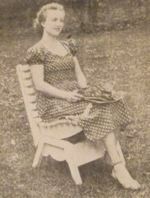 The chaise measures about 66 inches long by 24 inches wide. This is a vintage woodworking plan. Visit our FAQ page for a full definition. View the Larger Image Slideshow to see the actual item you are buying. This is a vintage woodworking plan. Visit our FAQ page for a full definition. View the Larger Image Slideshow to see the actual item you are buying. 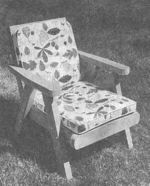 Nowadays we call this a sling chair but we assume there would be some rocking motion while seating comfortably in the cloth sling. Easy to make, everything you need to successfully build the project is listed on the plan. 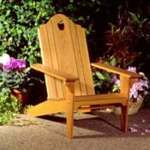 The rich brown color of redwood, and its resistance to decay, make it highly desirable for lawn furniture. But you may built this sturdy chair of white pine, fir or cypress if you prefer. The parts are bolted to make the construction strong and rigid. Seat and back are the right size for standard cushions (back is 21 x 21 inches, seat is 21 x 23 inches). The cushions are supported laced across the seat and back frames. This craft pattern makes it easy to construct with its full size details of the parts and assembly drawings. This is a vintage woodworking plan. Visit our FAQ page for a full definition. View the Larger Image Slideshow to see the actual item you are buying. You will want this new chair design for your lawn. The knock-down construction simplifies its storage between seasons. Full size drawings, materials list and instructions. Seat width is 20 inches. This is a vintage woodworking plan. Visit our FAQ page for a full definition. View the Larger Image Slideshow to see the actual item you are buying. Build an awesome folding lawn chair using these free instructions. This one was built using cedar. This is a vintage woodworking plan. Visit our FAQ page for a full definition. View the Larger Image Slideshow to see the actual item you are buying. A popular chair with sloping back and seat which once you get into you do not want to get out of. This craft pattern is detailed in two sizes. The smaller size will delight the children. This is a vintage woodworking plan. Visit our FAQ page for a full definition. View the Larger Image Slideshow to see the actual item you are buying. This roomy lawn chair has a form-fitting seat and back, and its back is adjustable. The chair folds to put away. This craft pattern shows full-size patterns for the curved parts to trace onto wood, sizes for all pieces, and assembly. This is a vintage woodworking plan. Visit our FAQ page for a full definition. View the Larger Image Slideshow to see the actual item you are buying. This modern adaptation of great-grandmothers favorite chair is a comfortable piece of lawn furniture as you would want to sit in. It has a free and smooth rocking action. The base is broad to prevent upsetting, and the rockers are held up by coil springs and wooden guides. Irregularly shaped parts are in full size in this craft pattern to trace. 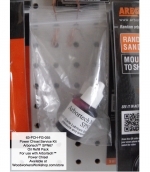 The cutting and assembly are easy. 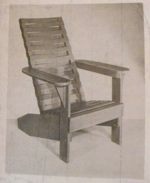 This rocker matches with pattern 749, 750 and 1748. Link Type: free plans | Link Source: TimberMart | Visit the category | Fix Link?